Developing an online reputation can be rather difficult so you never want to throw it all away if you don’t have to. The whole unpleasant nature of Black Friday and the clampdown on poker sites in the United States forced the hand of many sites but the people behind the Bodog site weren’t willing to fade away so easily. With over 15 years’ experience of poker, there was a lot to lose, which led to the launch of Bovada, providing an almost seamless transition for US poker players and poker players from around the world. The first poker bonus that will grab your attention on any online poker site is the welcome bonus. When it comes to the Bovada poker welcome bonus, you can receive a 100% matched deposit bonus up to a level of $1,000. The Bovada welcome bonus relates to the day of your initial poker deposit so if you were to add further funds to your online account on the same day as your initial deposit, the combined sum would be the amount that was eligible for your bonus. 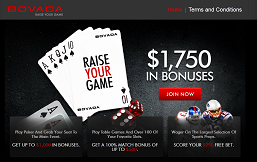 Click here to join Bovada Poker – Receive a 100% to $1,000 bonus with your first deposit. The welcome bonus is paid out when you reach a certain level of bonus points, which will be dependent on how much money your original deposit was for. The site has full details of the bonus points criteria for different bonus amounts and players have 60 days to meet the bonus requirements. You will also find a Bad Beat promotion on Bovada. This is available on Texas Hold ‘Em cash games and as you would expect, there are some criteria that needs to be fulfilled. Both of the pocket cards have to be used in the winning and losing hands, a minimum of 3 players must be involved in the hand and the winning and losing hands have to make their way to the showdown. The Bad Beat bonus on offer stands at 100 times the size of the big blind, to a maximum of $1,000. Even if you lose out, you can be a winner. The Royal Flush bonus is run along similar lines. It is also available in Texas Hold ‘Em cash games only. And again, both pocket cards have to be involved, there has to be a minimum of 3 players and the hand you hold has to take the pot, although it is not necessary for it to be in the showdown. The Royal Flush bonus can see you grab a bonus that is worth 50 times the big blind, up to a level of $200. A look at the promotions page on the site provides an extensive list of past promotions. While you may think that these promotions are of no use to you now, it indicates that Bovada is an online poker site that likes to offer a lot of promotions. This means you can sign up for the site with confidence that there will be plenty of fresh promotions coming to the site in the coming weeks and months ahead. When you choose an online poker site, you shouldn’t just be thinking about today, you should be looking for a site where you can play for many years to come. The Bovada poker site is definitely a poker option that looks well set to offer you a great range of promotions in the long-term so if this is important to you, this could well be the poker site that meets your needs and requirements. The software for the Bovada site is provided by the Bodog group so if you are looking for a more independent feel to your online poker experience, this is a site to keep in mind. There may not be as many players to put your wits against when choosing the Bovada poker experience but there are still more than enough poker players coming to the site on a regular basis. The Poker Scout stats for the site indicate that the daily peak for players sits at around just less than 3,000 players and the daily average for players on site any given time sits at over 1,000. This is clearly a decent return of figures and anyone that is keen to experience a popular poker experience that is slightly different from what is on offer from other online poker sites would be advised to have a look here. With Bovada providing online poker opportunities for US based players, this is a site that the wider online poker community can join in with. The poker table view is hardly flash or innovative but it is fairly reliable, which is surely one of the most important aspects for a poker site. When you play on the Bovada site, everything strikes you as being safe and reliable. If you are looking for something exciting or jaw-dropping in its innovative stance, you won’t find what you are looking for here but Bovada is an online poker site you can always return to in confidence. You are never far away from cash games on the Bovada site and there are always plenty of other players to out your wits against. Like most sites these days, if you’re looking to play in a cash poker game, you will likely end up playing Texas Hold ‘Em. With respect to tournaments, you really won’t struggle with Bovada. There are daily, nightly and weekly tournaments and then there are plenty of special promotions which run for a limited time. The Super Sunday is the biggest regular tournament of the site, with guaranteed prize pools of $170,000 but to play for even more, make sure you check out the big tournaments that the site offers regularly. When it comes to finding poker games that are not commonly available on the majority of online poker sites, Bovada is able to provide something of interest. Poker players that enjoy a game of 5 Card Stud will be delighted to learn that they can enjoy this game alongside the most common of poker disciplines and variations. If you want all of your online gaming activities in one place, Bovada is your obvious choice. The site provides a great deal of sportsbook and live betting options on a number of different sports. With promotions to choose from and more sports than you would normally look to find on an online sports betting site, Bovada has everything you could need. What makes Bovada a good poker network is their massive promotions. They are one of the largest US accepting poker sites.